Peter III of Aragon, known as Peter the Great, was King of Aragon, King of Valencia, and Count of Barcelona from 1276 to his death; this union of kingdoms was called the Crown of Aragon. At the invitation of some rebels, he conquered the Kingdom of Sicily and became King of Sicily in 1282, pressing the claim of his wife, Constance, uniting the kingdom to the crown. He was one of the greatest of medieval Aragonese monarchs. Ferdinand I, was the King of the Two Sicilies from 1816, after his restoration following victory in the Napoleonic Wars. 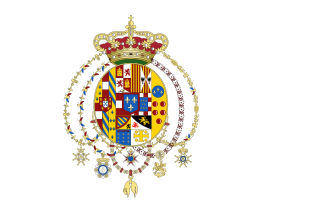 Before that he had been, since 1759, Ferdinand IV of the Kingdom of Naples and Ferdinand III of the Kingdom of Sicily. He was also King of Gozo. He was deposed twice from the throne of Naples: once by the revolutionary Parthenopean Republic for six months in 1799 and again by Napoleon Bonaparte in 1805. The Kingdom of Sicily was a state that existed in the south of the Italian peninsula and for a time the region of Ifriqiya from its founding by Roger II in 1130 until 1816. It was a successor state of the County of Sicily, which had been founded in 1071 during the Norman conquest of the southern peninsula. 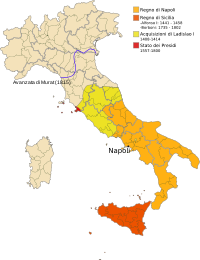 The island was divided into three regions: Val di Mazara, Val Demone and Val di Noto; 'val' being the Arabic word meaning 'district'. Louis III was titular King of Naples from 1417 to 1426, Count of Provence, Forcalquier, Piedmont, and Maine and Duke of Anjou from 1417 to 1434, and Duke of Calabria from 1426 to 1434. The War of the Sicilian Vespers or just War of the Vespers was a conflict that started with the insurrection of the Sicilian Vespers against Charles of Anjou in 1282 and ended in 1302 with the Peace of Caltabellotta. 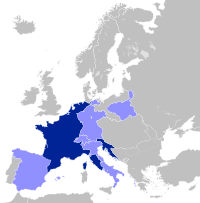 It was fought in Sicily, Catalonia and elsewhere in the western Mediterranean between, on one side, the Angevin Charles of Anjou, his son Charles II, the kings of France, and the Papacy, and on the other side, the kings of Aragon. 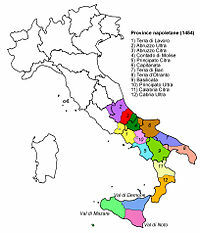 The war resulted in the division of the old Kingdom of Sicily; at Caltabellotta, Charles II was confirmed as king of the peninsular territories of Sicily, while Frederick III was confirmed as king of the island territories. Constance of Sicily was Queen of Aragon as the wife of King Peter III and a pretender to the Kingdom of Sicily from 1268 to 1285. She was the only daughter of King Manfred of Sicily and his first wife, Beatrice of Savoy. The House of Valois-Anjou was a noble French family, deriving from the royal family, the House of Valois. They were monarchs of Naples, as well as various other territories.